My special guest today comes from a well known CAT BLOG…yes…that’s what I said…a Woofie living most quietly on a very populated CAT BLOG. 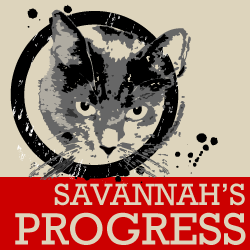 Savannah: Hiya Grete! I can’t tell you how purrleased I am to be having this woof session with you! Thanks so much Grete. Now first, I think readers will want to hear how you came by your name. It is an unusual name, don’tcha think? Grete: Well, it might be unusual to some, but it is really familiar to me!! When I was advertised on Petfinder.com, my name was Gracie. That was my name in my previous life. Mom and Dad actually LOVE the name…but it belonged to Mom and Dad’s Guardian Angel Borzoi…the amazing Gracie. Mom and Dad didn’t want to upset me too much so they thought that they should change my name to something not so different. So they kept the GR and came up with Grete. I love it! It was good to have a fresh new start and a cool new name. Savannah: Actually, I think it is just purrfect for you too. 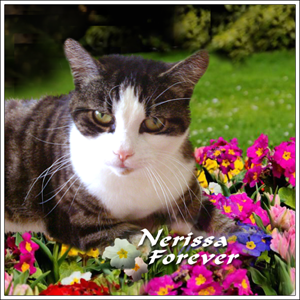 Now, just to get started, will you share with all of us how you arrived in your furrever home? Grete: I had a very interesting and confusing start in life. My first home…well; I think that is where I was named Gracie. Anyway, from what my mom was told I was picked up by Animal Control in a county about 30 minutes from where I now live. When they picked me up, I had a microchip, but I was traced back to an owner who was forced to give me up…they did that in a completely different county than ours…about 45 minutes from where I now live. This is where it gets really confusing. The county where I was given up originally sent me off to a local rescue group that adopted me out successfully. But it wasn’t so successful after all since I ended up on the streets once again…no one knows how or why. By the time my Mom and Dad found me on the Animal Control website, through Petfinder.com, I was 22 months old. I was lucky that Mom was looking at Petfinder on a regular basis. One day, there was my photo and Mom and Dad immediately dashed off to meet me. When they got there I was in a concrete kennel. All the other dogs were barking and jumping up and down, but I just sat there. After they sprung me, we had a meet and greet on the lawn and I immediately took it upon myself to plant a kiss on Mom. It worked! Mom and Dad also asked them if I would be ok with cats and they thought I would. Next thing I knew is that Mom went in the office and Dad stayed with me outside. After what seemed like forever, they invited me to jump in the car. I hopped right in and I knew this was my lucky day. Savannah: Oh Cat! Grete, you must have been soooooo excited to busted out of jail and then you got a car ride to your new home…PAWSOME!! So, how did it go with the cats…aren’t there several over at Cory Cat Talk??? And maybe give a few woofs about any challenges you had to face when you moved into your furrever home? You know, was it hard to show your REAL SELF at first?? Grete: Well, I thought I had it made once I jumped in the car. They took me home and let me come inside the house. They kept me on a leash the whole time. I didn’t understand…but once the door opened I saw all of these kitties! Whoa! I barked one bark. “HELLO”! I think my biggest challenges in the first couple of weeks were meeting and getting to know my new “pack”…I realized I was now a cat herder. To keep us all safe, Mom and Dad kept me on a leash at all times, even in the house. At first I was deemed the perfect dog, but as time passed and I got more comfortable, some of my issues came out. I was deathly afraid of lights like car headlights, flashlight, even sunbeams when they flicker out of control. I was also afraid of sirens and I would howl mournfully every time I heard one. Vacuum cleaners are evil and I run and hide when mom takes it out of its hiding place in the closet. Grete: heh…heh…no problem Savvy. Glad to know I am not alone in fearing that HOOVER! So, health wise, I had an intestinal bug and my system was all messed up. That took awhile to get all better. The worst of it was that my Mom was taking me on long walks and she started to run with me. I loved that time together, but it didn’t take too long for Mom and Dad to discover I had pain in my elbows. I was diagnosed with bilateral elbow dysplasia! Savannah: OH Grete! You just couldn’t catch a break in the beginning, huh?…what happened?? 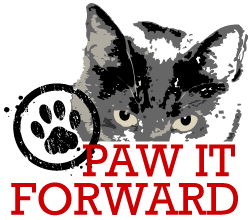 Grete: After my diagnosis with bilateral elbow dysplasia we knew I’d have to get treatment…but one day I was playing with my Dad and I put my paws up….and my paw got caught in his pocket. The next thing I knew I was howling with pain. It was horrible! Dad felt guilty. I knew it was not his fault. This meant my treatment became an emergency. I was scheduled to have my first surgery on October 1st 2008. I had to be on total rest during my recovery and then gradually I could go out in the backyard, on a leash of course. My second surgery happened in December of that same year. Did you know that once I was all recovered from my elbow surgeries I thought I was DONE! But, the biggest surprise of all was when I went into heat! When I was adopted from Animal Control, Mom and Dad were told that I was spayed. Well, I was not! Ha! So, I went in for my spay surgery in April of 2009. I had 3 surgeries in my first year in my new home. Savannah: Grete, you were so brave having to go through so many surgeries as soon as you got to your furrever home; please tell us about the great progress you made when you started to work with your Mom and Dad to help you become a furramily? Grete: My progress in getting acclimated was not easy. I went to basic obedience class when I first arrived, but that was not enough for me. I had issues. Mom and Dad took me for 8 weeks of private lessons with a woman who specializes in German Shepherds. I was very over reactive to other dogs. I would bark like crazy if one got within 50 feet of me…or more. We practiced a lot…the trainer had 3 German Shepherds so I had to get used to having them walk by me…me walking by them. Me getting used to seeing them when they weren’t where I expected them to be. That helped me a lot. I also passed the test at doggie day care so I’m approved to go play with the other dogs there. I really don’t like being anywhere away from my family, but Mom and Dad say it’s better that I have a place I can go when needed. Savannah: Grete, your rescue is so impawtant for others to learn from. Of course, we adult shelter rescues sometimes have challenges that we cannot tell our new furrever furramily…we have no “human” voice. But no matter, we all have so much joy and love to share in our new homes. So I promise, this is my last question; can you offer any advice to our readers to help them support their adult rescue dog, or one they may be thinkin’ about bringing into their home, through its recovery process? Grete: Mom remembers talking to someone who was complaining about an adoption fee for a purebred dog. They were looking for a “free dog”. Ha! There is no such thing. If you think about it, Mom and Dad adopted me for $100. Yes, a bargain I know! 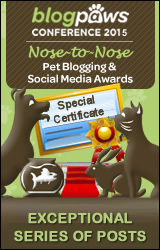 I also came with a certificate for an initial exam, and coupons for doggie stuff. To be real…you know how much I really cost? Now my mom will tell you I’m priceless…but for those looking to adopt you might as well get full disclosure. Between all of my doctor visits, surgeries, medication…by elbows cost around $10,000. My spay surgery was about $450. My dog training lessons…mom can’t remember, but that was an additional cost of several hundred dollars. This is on top of all my expected expenses of food, boarding, squeaky balls, licensing…and regular vet care. I want to let everyone know that there is no such thing as a free dog. I was VERY lucky that my Mom and Dad were willing to do whatever was necessary to take care of me. It could have easily been curtains for me if the people at animal control figured this out before my Mom and Dad sprung me from that awful concrete kennel. Also, with all of my rescue issues, with love and patience, I’m much better about all my fears. I no longer howl when I hear a siren. I still don’t like the vacuum cleaner but I know it will not harm me. I whine and talk a lot and that has never changed. It never will. It’s who I am. Savannah: (Savvy reaches over to Grete and gives her a gentle paw pat…)…Oh Grete…you have so much wisdom to share with all of us. I cannot thank you enough for coming to have a few woofs with me. Anything else you want to add??? …and I have forgiven them that they did not tell me I was going to live in a cat house. …Anywho, I still would have said yes!!! Grete, you are so right about being one lucky woofie!! Give me some high paw pats!! whap, whap, whap! Pawsome interview!! Thank you so very much. Well, that’s it for today. Hope you will all hop over to where Grete lives and let her know how much you enjoyed her interview today. 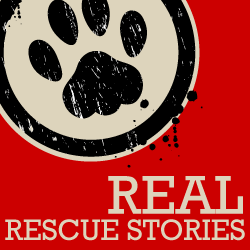 Thank you ever so much for visiting and learning about Grete and her adult dog rescue story. Grete is a cool woofie! What a great interview yous did with her Savannah! great interview on grete, nice to meet him. and glad that he has found a loving home. Such a wonderful interview Savvy and Grete is gorgeous. Yip, definitely no such thing as a free dog, or cat, or any pet. I am so please that she landed up with people who would do whatever was necessary to help her through. As always, time is what is needed the most for the adult rescues. Grete is gorgeous! I’m so glad she’s in a happy home. That is one great story. Happy Gotcha day Grete! Oh Savannah! I LUFFED reading about Grete! I know lots of the kitties at Cory’s but not much about Grete till today. I know she’s a woofie and all, but I think she is so beautiful! (I don’t really think I want to meet her though). Awww Spitty, did you know that Grete LOVES me? I think because you kinda look like me that Grete would love you too. Maybe come over in your Furrari and give her a chance. She even lets me eat out of her kibble bowl. Thank you for being such a good furriend Speedy and for being patient cuz I have been absent for so long from comment queues. I hope to be more regular over next few days. Leo comes home today we hope. Still not eating though…sad ears, paw hugs Savvy peeEss Mom saw a 34 pound bunny at Blog Paws, and she got to pet him! She loved it!! Grete is such a sweet woofie pal and we all love her and her wonderful family! Whoa! that’s one expensive woofie! Hope all her surgeries are in the past. We just love Grete! She is one of our most favourite woofies ever, and we really enjoyed reading her interview. We know she lives with the best family possible, and are so grateful! That was a great interview, Savvy. One of your best! Grete is one very lovely lucky doggie! And it is her gotcha day too!!! Hi Savannah! Y’know, Grete is one of our favorite woofie furiends! And Sparkle is right…today is Grete’s Gotcha Day! Thanks for featuring her so that everybuddy can meet her and see what a great woofie she is! 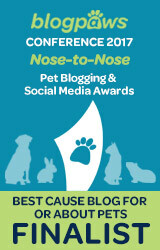 pee ess….The mom says she loved meeting your mom at BlogPaws! They really had a great time. Thanks for interviewing my beloved woofie Grete! I was one of the kitties who went vertical when she woofed. My eyes got big…and *bing* there I went! Ha! Then I ran and hid. I love her now. It didn’t take long for us to realize she loves her family and that includes all of us kitties. I just added a link to this post on Grete’s Gotcha Day post! MOL I would have liked a photo of that meeting too Easy! Mom comes home tomorrow!!!! YEA!!! Lucky Grete…..finding a forever home complete with a crowd of cats! Awesome story, Grete. Thanks for sharing her, Savvy. What a lucky doggie to have found such a perfect, loving home. I have thanks, I was very intrigued by some of the auctions up for grabs – especailly doggies pant!! O i am so pleased it went, I had a look at the auction and panicked for a moment that no one had wanted it, and I was worried I had failed in my attempt to help! That has my tail wagging in helicopter style! Great interview Savvy..and what a great doggie is Grete 🙂 love a happy ending! thank you Jerome for following me. I just visited your bloggy and when Mom Linda gets home we will explore it some more and follow you. We love you photos! What a fun surprise, featuring Grete on her gotcha day! we did not know!! so embarrassed I did not get a card to Grete…pink ears…Mom Linda is still back East but she will be home tomorrow afternoon!!! Yea!! !